On Saturday, May 10th at 09:46PM, Spokane Fire Dept Companies responded to a reported natural gas leak that had ignited in the backyard at 2529 W. Queen. Engine 13 from Wellesley and Jefferson arrived first on scene and reported heavy flames shooting 15 feet out of the ground with the home exposed approximately 15 feet from the fire. The Engine 13 crew quickly extended a pre connected lead to protect the exterior of the home from the extreme radiant heat and falling embers onto the roof. Other companies were assigned to the interior of the home to check for fire extension and supply water from a nearby hydrant. It was soon confirmed all occupants had escaped the backyard and residence. The fire was allowed to burn until AVISTA arrived and remotely shut down the residential gas leak. The home was completely protected with no structural damage from the natural gas fed fire. The occupants of the home reported that there had been a birthday party with 15 friends enjoying a backyard camp fire. Fortunately most of the friends were dispersing when the fire melted and breached the plastic natural gas line that serviced the home. This resulted in the reported initial gas explosion and the intense gas fed fire. One male guest was transported for a syncope episode possibly related to the intensity of the event. The occupants reported there was one male with minor burns to his arm that had left the scene. 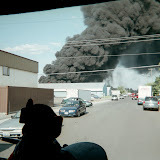 This was not confirmed by Spokane Fire Dept Officials. The occupants were allowed to return to their home without natural gas service until the line could be rerouted. Cause: The gas leak and fire occurred due to the heat of the backyard fire melting and breaching the plastic natural gas line buried inches below the pit. This incident is a reminder of the importance of having all utilities located prior to digging. Damage: The only damage reported was to the natural gas line. Avista, AMR Ambulance and the Spokane Police Department providing traffic control.